Weighing a mere 12 oz., this slim, lightweight external CD/DVD burner fits easily in a laptop bag and allows you to read/write CDs and DVDs any time, any place (8X DVD Write Speed, 24X CD Write Speed). For added convenience, the drive draws power from a USB port on your notebook or ultrabook - with no extra AC cables to transport. 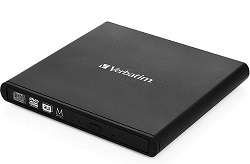 In addition to supporting all common CD and DVD formats, for both read and write functionality, the External Slimline CD/DVD Writer is M-Disc ready to provide an archival solution with industry-leading disc lifetime expectancies. It is ideal for backing up sensitive data as well as music and video libraries. The CD/DVD writer features Nero Essentials software (Windows operating systems only) for seamless archiving and reliable secure disc burns.